Inventory We are a resale marketplace, not a box office or venue. Ticket prices may exceed face value. This site is not owned by Ohio Theater Columbus . The Ohio Theatre was built in 1927 and declared a National Historic Landmark in 1977. The Ohio Theatre box office is located at 39 East State Street in downtown Columbus, Ohio. The Ohio Theater was known for years as the Loew's Theater Ohio until it closed down in 1969. The Ohio Theatre Columbus was in serious danger of being demolished at that time. 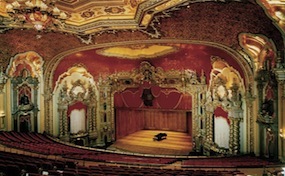 The Theater went through massive restoration during the 1970s. The Ohio Theater in Columbus is home to the Columbus Symphony Orchestra, BalletMet, Opera Columbus, the Broadway Series, and the CAPA Summer Movie Series. The Most popular Ohio Theatre tickets are for the traveling Broadway shows that stop in Columbus. Ohio.TheatreColumbus.com is not a primary vendor, supplier, or affiliated with any official website. We proudly provide access to a large supply and low prices online for all secondary market events. Ticket prices may be well below or above face value and will fluctuate with the market. To purchase tickets for all Ohio Theatre Columbus Events simply click on the show of interest or call our operators at anytime.